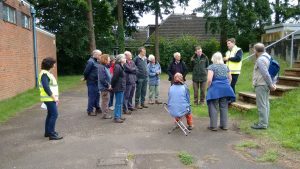 The Open Day in the Old Churchyard in 2010 showed us the value of getting together with visitors (from near, and not so near) who were either unfamiliar with the history of the area and the Old Churchyard or who knew a bit but wanted to know more. As mentioned in the section in the History Project Section (click here) visitors came with photographs and stories to share while we (or mainly Wendy Maddox, our main researcher) were able to fill in some family details. When the Group was approached by the Farnham Society in 2013 to participate in the Society’s annual programme of Heritage Open Days we were keen to take part and advertised a free guided tour of the Old Churchyard and the immediate area, which is closely associated with local writer George Sturt (here and here). The walk that year, and repeated in 2014 and 2015 took place on a Friday evening, repeated on the following Saturday morning. 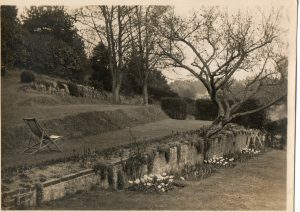 The format was based loosely on an evening introduction to the Bourne which BCG had previously provided for the Friends of Farnham Park at their request. The very first tour, on the evening of Friday 13th.September 2013, was not propitious; it rained heavily throughout but those who came along stayed to the end. Visitors assembled at St. Thomas-on-the-Bourne Church to be welcomed by Noel Moss and Martin Angel, who described the building of the present Church on one of the many shallow gravel pits in the Bourne area–Ward’s pit. Visitors were able to handle a Stone Age (early Paleolithic) axe head which is one of a collection of similar items uncovered during excavation for the Church’s foundations in 1911 and now kept in Farnham Museum. From there it was a short walk to the Old Churchyard where the visitors split into two groups one of which was introduced to the ecology and history of the Old Churchyard while the other walked down Old Church Lane. The two groups then exchanged roles. 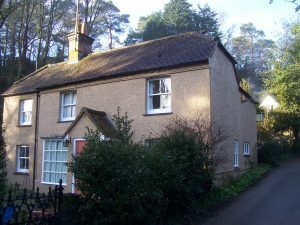 The walk down the Lane stopped at Vine Cottage, where Sturt had lived with his two sisters. 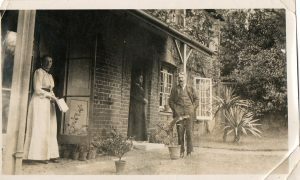 The , present owners had kindly agreed to the group going into the garden to hear a short extract from Memoirs of a Surrey Labourer in which, sheltering from the rain, Sturt watches his gardener Fred Grover at work in the garden and the two discuss local affairs. 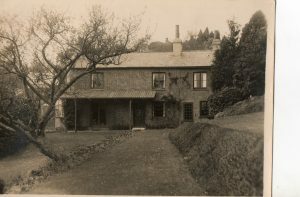 The walk moved on to Little Willows, the small cottage beside the Bourne Stream where Fred and his wife Lucy lived for a time, before going along Sturt’s Walk and past the pumping station to view The Fox pub and Wilbraham Taylor’s temperance hall, now the local Scout centre. For pictures of Old Church Lane painted by Sturt’s friend W.H Allen and for more about the friendship between the two men (click here). For the tour of the Old Churchyard itself we were able to add further information that had come to light since the 2010 Open Day about some of those buried or commemorated in the Old Churchyard. For example, it had not previously been recognised that one of Colonel Paget’s daughters, who managed The Spinning Wheel antiques shop in Farnham had bound a copy of the Bible that was presented to the USA by King Edward VII. On a visit to Farnham, Princess Mary and her children ‘dropped into’ the Spinning Wheel, before going on to purchase postcards from Sturt’s newsagents in the Borough. The same daughter attempted to donate to the town a drinking fountain designed by Harold Falkner and constructed by Sturt & Goacher [Ewbank- Smith’s Edwardian Farnham]. 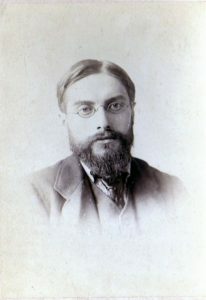 Similarly, it was not known that Fred Grover had travelled very widely throughout the country, even, as a young man, attending a wake in Liverpool, an experience that he apparently did not much care for. We know that he signed up at 16 and served in the Crimean War for just under two years (click here). In the following years – 2014 and 2015 – we followed the 2013 format with some extra features added to the tour. For the 2014 event the weather was much kinder than it had been the previous year with patches of sunshine. 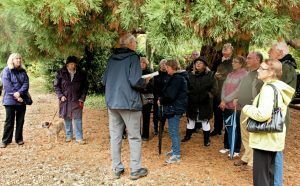 There were about 20 walkers on each occasion and on the Saturday walk one couple had travelled up from Dorset because of their particular interest in George Sturt. In addition to the stop off at Vine Cottage, the tour visited a site in Middle Bourne Lane where the young William Cobbett, who is probably best known for his Rural Rides and who later went on to found the Parliamentary record, Hansard, is alleged to have played with his brothers. Here visitors heard an extract from Rural Rides in which Cobbett’s describes how their robust play taught him a few things that were to serve him well in his remarkable later life. 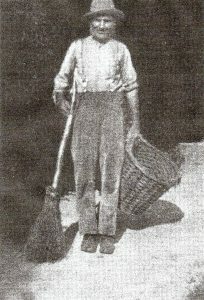 Attending one of the 2014 tours was Susan Bird, whose great aunt was Bessie Prior (nee Firmin), for many years housekeeper to Sturt and his sisters at Vine Cottage. 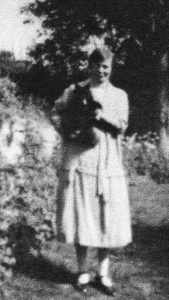 Susan brought with her some unseen photographs of Bessie and the Sturts and Richard Sandars was later able to provide her with a list of all the references to Bessie in Sturt’s Journals. A few weeks later Richard and Noel Moss met with Susan and her cousin, Jacqui, to look at various documents and a number of other photographs of life at Vine Cottage. For the 2015 tour leaders were able to provide some of the history about Havelock Cottage where Fred Grover’s wife Lucy grew up. The story of those times is not a happy one as Lucy’s father was an alcoholic who eventually took his own life. In the Old Churchyard we looked at the sign boards which BCG has placed where we believe the unmarked graves of Fred and Lucy are located, giving short descriptions of the two drawn from Sturt’s Lucy Bettesworth and The Bettesworth Book. For our contribution to the 2016 and 2017 Heritage Open Days we decided to do something slightly different. While researching the graves in the Old Churchyard, we had become aware of the high level of infant mortality, not only in the Bourne but nationally, during the eighteenth and nineteenth centuries. The early deaths of George and Susannah Jeffery’s four children, mentioned in the History Project (click here)and the graves of other young children bring home this tragic loss of young lives. 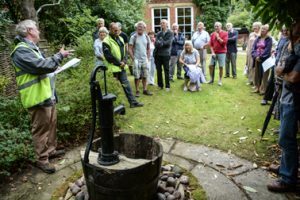 Knowing that there had been recurrent cases of cholera, dysentery and typhoid recorded in Farnham in Victorian and Edwardian times, we decided to look into the history of the local water supply and the management of effluent. We approached South East Water who were keen to link up with us in putting together a guided walk – “From Wells to Mains; The story of Farnham’s water supplies”, which would take in the Victoria Reservoir and the bore-hole in Sturt Walk..
As with earlier HOD tours, St Thomas-on-the-Bourne kindly offered parking and an assembly point. 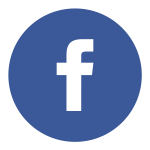 With the 2016 tour it was soon apparent that the event had struck a chord, with some sixty visitors gathering at the Church, necessitating three groups This enthusiasm encouraged us to run the same tour in 2017 as one group. Before setting off visitors were told about the geology of the area and how this had influenced the ways in which previous generations had lived their lives in The Bourne. Before the arrival of a mains supply in the nineteenth century, access to water supplies in the low-lying Wey Valley was comparatively easy, but in The Bourne, where the water table lies over 150 feet below the greensand plateau that extends through Frensham to Hindhead, it was a serious problem. 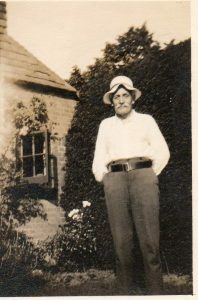 As local author George Sturt recorded, a cottage supplied with water from a good well was “a precious thing in this village” – an asset that is difficult to appreciate fully nowadays. As in many similar communities, local people obtained their water either from streams and wells, or by storing rain water. Human waste was either collected in cess pits and then spread on land as fertiliser, or passed into streams or rivers. Cess pits were often dug close to the wells, which inevitably resulted in cross contamination and hence the spread of disease. In the Bourne, problems were further exacerbated during periods of drought when the Bourne Stream ran dry, so there was greater reliance on the wells, some of which also dried out. In his unpublished ‘Very Informal History of the Bourne’ Henry Sidebotham, the first vicar’s son, mentioned several years of bad drought when the shallow wells of the cottages ran dry and a bad epidemic of diphtheria broke out. With the large number of visitors in 2016 it was necessary to divide into three groups which followed rather different routes with one starting at the Victoria Reservoir, opened in 1897, as a plaque, just visible from the Frensham Road, attests. Here we were welcomed by Doug Whitfield (SE Water’s Head of Operations), who outlined the history of the reservoir, which supplies water to most of Farnham. The water, which is drawn from the 134m deep bore-hole in Sturt Walk, is processed and stored on the reservoir site. Originally, the processing was by filtration through a large sand bed, but this has been replaced with the modern hi-tech equipment that is housed in the building to the rear of the site. Inside the plant Doug explained the filtration process and answered various questions. 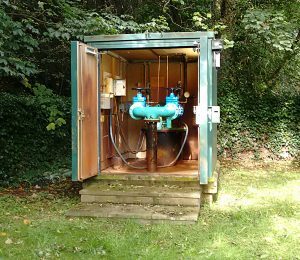 Many disused wells are still to be found in the area and the group visited one of these in the garden of the Old Vicarage where the walls of the well still exist. They also stopped at the site of another at on the junction between Middle Bourne Lane and the Frensham Road (known as Gravel Hill). On Gravel Hill a standpipe was installed from which villagers could buy water using tokens they could purchase for a shilling. Both the well at the Vicarage and the stand pipe were referred to by Henry Sidebotham It seems likely that it was this standpipe that was being referred to by George Sturt when in 1899 he described the ‘water meter’ on Gravel Hill, which had been set up as The Bourne’s Memorial to celebrate Queen Victoria’s jubilee. The arrival of mains water and an effective sewage disposal system was slow in coming to Farnham, and even slower in coming to The Bourne. This was largely because of the somewhat parsimonious local council, which was only spurred into action by the court injunction taken out by the owner of Moor Park House – John Frederick Bateman – to stop the foul stench being emitted from the sewage polluting the River Wey On the 2017 walk we were able (at our request) to visit the borehole site and see the pumping equipment. There we were briefed by John Atkinson, a previous employee of SE Water. Finally, we climbed back up the hill to the Old Churchyard where we had identified several graves of young children. Although the primary causes of their deaths have often not been recorded, undoubtedly in many cases their deaths were caused, directly or indirectly, by diseases contracted from drinking polluted water.